Khadidija Diouf, a junior global supply chain management major and student ambassador at the John Chambers College of Business and Economics, is pictured in the AeSC Center. The center, offered to WVU business students, provides students with tutoring, career coaching and assistance with business communication skills. Students in the John Chambers College of Business and Economics at West Virginia University now have one place to get supplemental tutoring for intensive classes, help in writing and speaking skills that will bolster achievement and assistance in getting ready for the job they want. A newly revamped facility, the Academic engagement and Success Center (the AeSC acronym, pronounced “ask”), is a center that features the kinds of assistance they need to not only excel academically, but will also propel them into their careers. The most unique aspect of the center is that it operates primarily with students helping students. 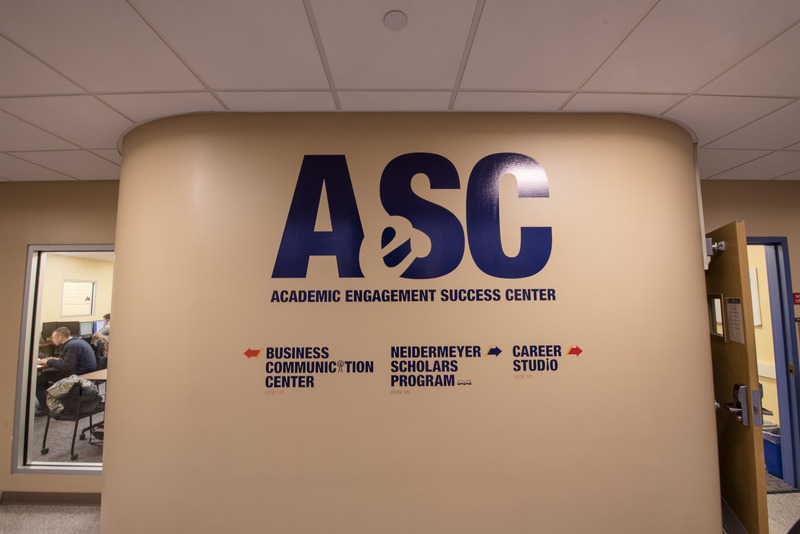 AeSC has three major components: the Neidermeyer Scholars Program, the Business Communication Center and the Career Studio. Elizabeth Tomlinson, teaching associate professor of marketing and director of the Business Communication Center in AeSC, said students benefit from learning and polishing communications skills, which elevates the impressions they present and their confidence. “The Business Communication Center offers writing and speaking help to all students in the Chambers College at both the undergraduate and graduate levels. We partner with sections of our Business Communication classes for out-of-class tutorials to support specific written and oral communication tasks,” Tomlinson said. “We offer peer-led and informal coaching in the areas of career and industry exploration, basic interview techniques, professional document creation and review, and job search strategies. The goal is to help students understand what it takes to be career-ready and to establish their professional goals early in their academic careers,”said Sarah Glenn, associate director of the Center for Career Development at the Chambers College. Lantz said the AeSC Center is an important resource for students as they navigate their collegiate careers. “The resources we offer students at AeSC are not only designed to help them be better business students; they’re designed to help them be the best students they can be,” she said.